There’s an old saying that goes “it’s not what you know, it’s who you know.” Here in 2011 that statement needs a little updating and I am happy to do it for you. “If you know Thrillist Rewards, it’s all about who the Rev knows.” Let’s take it from the top. Thrillist is the free daily email that finds the best of what’s new in your ‘hood & on the web. If you’re an urban warrior with an appreciation for the newest, coolest, craziest reasons to keep your address inside the city walls, Thrillist is a great way to have access to insider information. Go sign up for the email, you’ll love it. Thrillist Rewards is a special, weekly email featuring jaw-tremblingly cool, limited-time-only experiences that we custom-make with local businesses — all at a sweet discount. Each of the rewards offered by Thrillist are road tested by the staff members themselves to ensure a high quality, enjoyable and (drum roll please) rewarding experience that makes any urban warrior feel like they have the keys to the kingdom and the best part, at a cheaper price. You’re going to want to sign up for Thrillist Rewards right now, go ahead…I’ll wait for you. 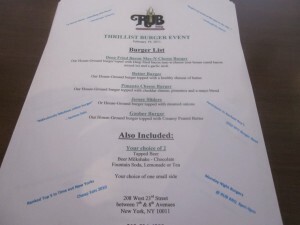 Rub BBQ, home to the best burgers in NYC as well as some of the most amazing BBQ North of the Mason Dixon and the Monday Night Secret Burger. For those in the know, you’ve stopped into Rub on a Monday night after 6 pm and had one of Chef Scott’s crazy burger creations, NONE of which have ever been repeated…until now! 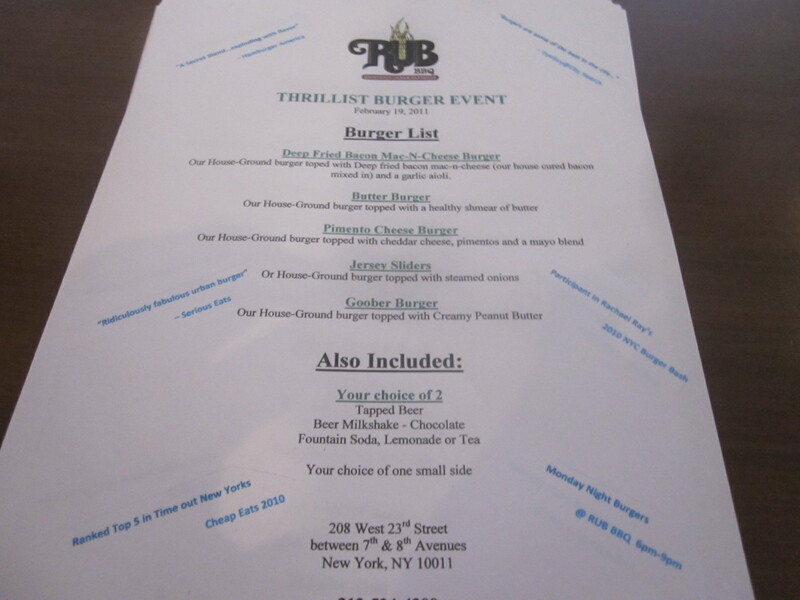 Owner Andrew Fischel and Chef Scott decided to throw a one day only Off-Menu Burger Bash event for Thrillist Rewards subscribers. People who purchased the reward would receive 5 different specialty Rub Burgers, 2 booze- fueled milkshakes and choice of one side item…all for only $35!!!! 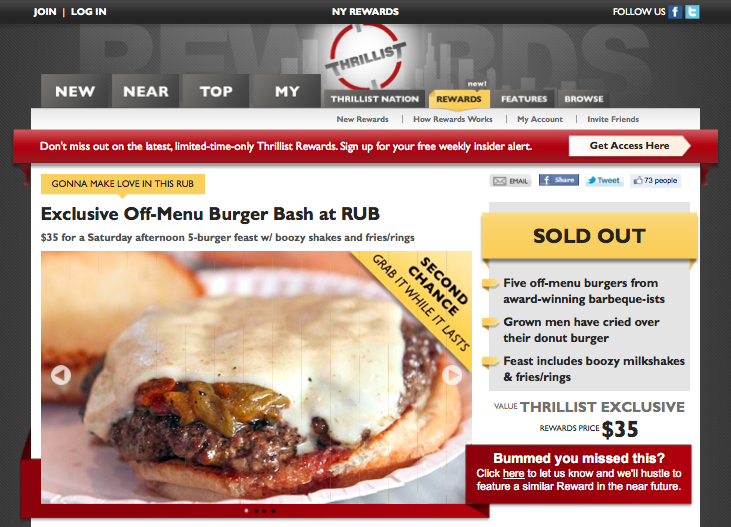 The Thrillist Reward sold out immediately and with demand SO HIGH, Andrew decided to throw a second one, back-to-back with the first. 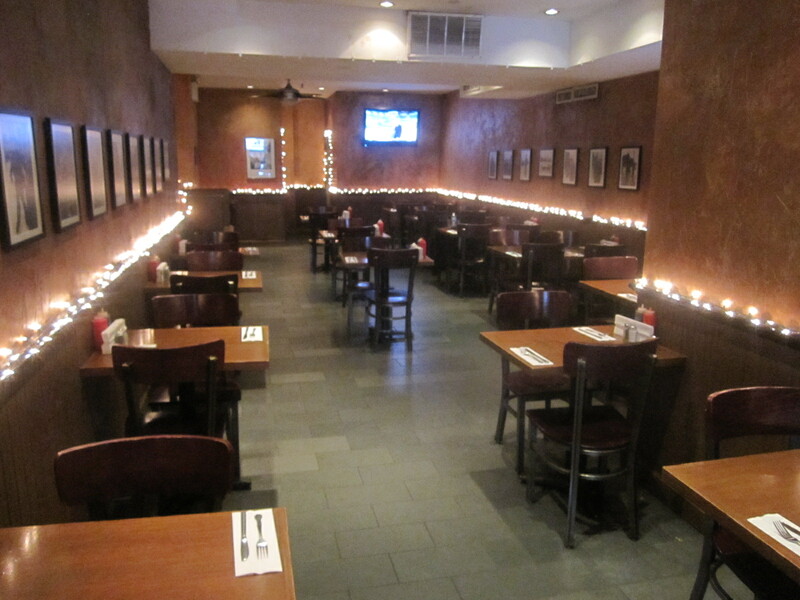 I got in a little early to help out before the masses rushed in to shove burgery-goodness into their mouths. 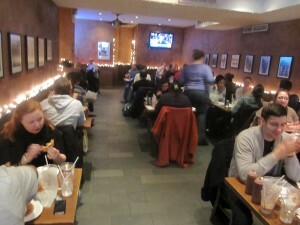 While the dining room was still it was all frenzy in the kitchen as the staff was preparing to serve nearly 500 burgers in only a couple of hours. Each seat had the menu of the day placed as if only to tease and excite. Up first, the friendly and accommodating brought around drinks. 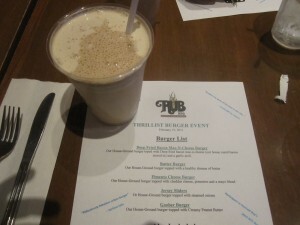 I opted for the chocolate milk shake made with Abita Turbodog beer. It was a sweet and hearty tasting treat that was less thick than a shake but had more substance than a beer. Sounds like it wouldn’t go well together, became even more delicious together. 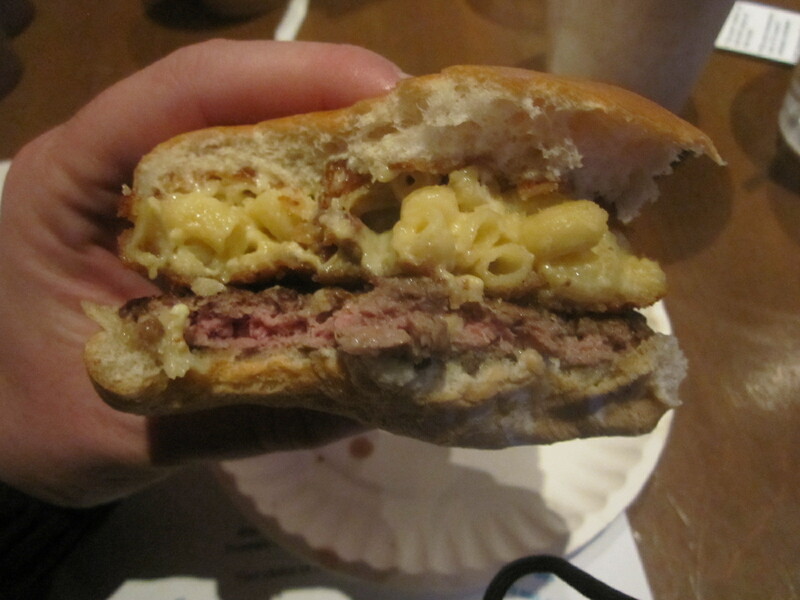 House-Ground Burger topped with Beep Bried Bacon Mac-N-Cheese (with the Rub BBQ house-cured bacon mixed in and Garlic Aioli. If the name wasn’t enough to excite you, know that it’s as great as it sounds! The Deep Fried Mac unto itself was pretty amazing not only taste but also in theory. 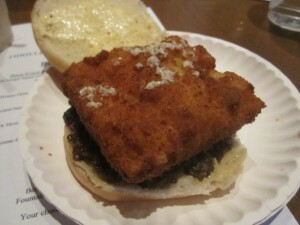 It was a carbohydrate heavy, calorie-laden, fat-filled bomb that was created to make mouths and tummies happy. 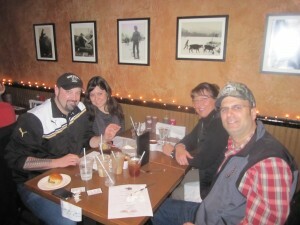 Top that on an amazing piece of high quality ground beef cooked, as always at Rub BBQ, to a PERFECT medium-rare and you have a legendary burger. As I sat with my Mom, wife Cara and Box from SteakClub7, so we were able to mix-n-match and share our side selections. 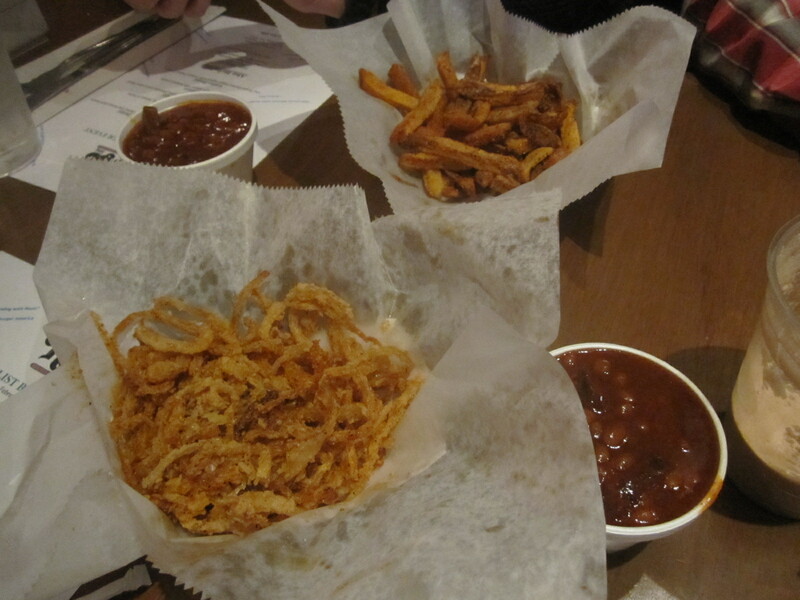 We got the sweet and salty Onion Straws, the Rub BBQ spiced whole Fries and 2 orders of the BBQ Beans made with Rub BBQ’s famous Burnt Ends. Each of which was awesome but the BIG WIN came from letting the Fries take a ride into the BBQ Beans! Try as we might to not eat all of it, knowing we were going to be eating a pound of meat alone, we couldn’t help but polish nearly all of them off. 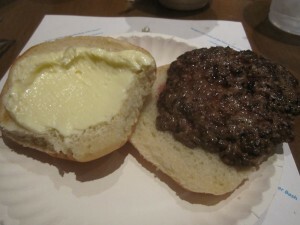 House-Ground Burger topped with a healthy shmear of Butter. Made famous by Solly’s Grille in Milwaukee, WI is EXACTLY what the name implies, a burger with Butter on it. What may seem like a scary prospect is actually a great Burger but it requires just a few moments of patience. Once pop you dropped jaw back into place, your instinct will be to take a bite but you should not. Instead, cap the Burger and wait. The true joy of a Butter Burger is once the Butter has melted all over the Sandwich, combining with the natural juices of the meat. I mean, done right, you’ll still have some thick Butter on top, but trust me, melting is the key that unlocks the savory joy. House-Ground Burger topped with Cheddar Cheese, Pimentos and a Mayo blend. If you haven’t picked it up yet, toppings or not, Rub Burgers are fantastic. That being the case, you’d have to try really hard to put something on top (or underneath) to ruin them. Which to me means, I am willing to try just about any version of them Chef Scott and Andrew create. The Pimento Burger, a Carolinian special, is one example, that actually didn’t have that much risk involved. You see, Mayo and me aren’t so big of friends and Olives are a definite no-no. But I’m a grown boy and this is Rub BBQ so there wasn’t really much choice. I’m glad to say I bit into this without hesitation! The creamy cheese and slight spice of the Pimento made for a zesty Burger topping. House-Ground Burger topped with steamed Onions. A slider is a form of burger made from a thin patty that is flat griddle along with onions, whose steam helps to cook the burger. It’s server on a squishy white bun with or without cheese and pickles. 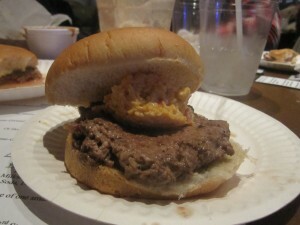 While NJ has the Slider claim to fame, Michigan gives them a pretty good run for their Burger money on the idea. My Mom and I are both from Detroit so this menu item was something we were heavily anticipating. But that’s not the only reason I couldn’t wait to try the Jersey Slider. Just before the event kicked off Chef Scott told me that he used a juicer to pulverize Onions and turn them into juice. When the burger went into skillet, it was then poured over it and the Onions to help really steam the onion flavor in. 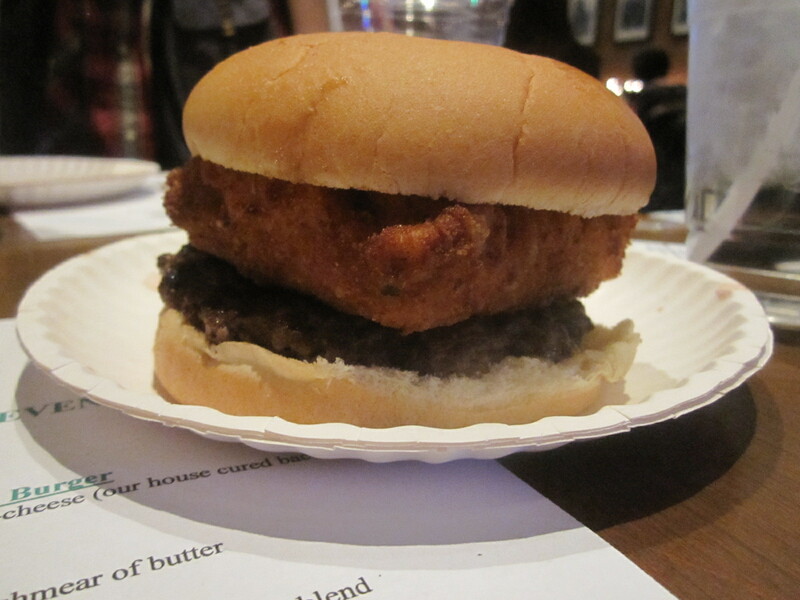 Made in a much smaller size than the previous 3, this burger was nothing short of AWESOME. In fact, if I could only use one more word to describe it, I would choose to use AWESOME again. 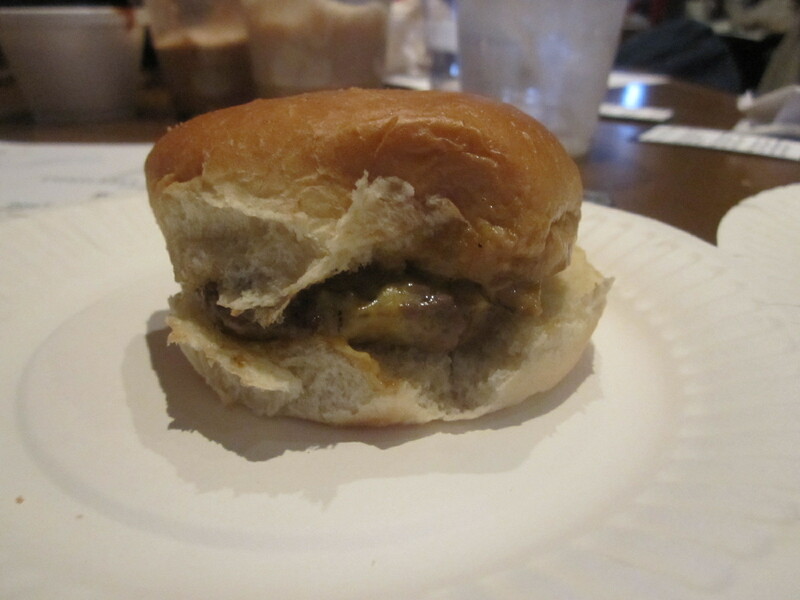 The AWESOME AWESOME Jersey Slider, even at it’s tiny little size, was some how magically still cooked to an absolutely perfect medium rare and was BURSTING with sweet onion flavor. 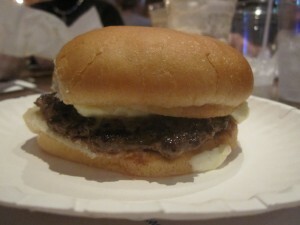 Topped up with a savory slice of cheese and served in an oh-so-squishy mini roll, this little bad boy was BIG on taste! The best part, if you’re a city dwelling Thrillist Rewards subscriber, you don’t need to cross any bridges or tunnels to get a great Jersey Slider. House-Ground Burger topped with Creamy Peanut Butter. Yeah, you read that right. 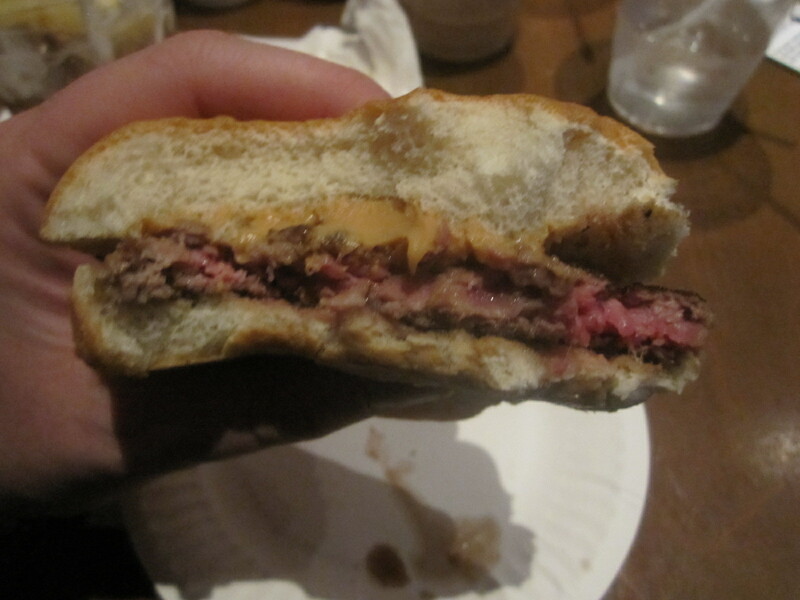 It’s a Burger with Peanut Butter, which I consider to be the Bacon of the condiment world. 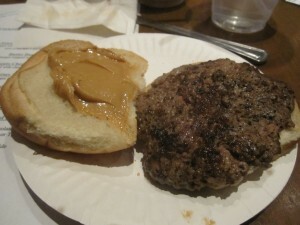 Peanut Butter, much like Bacon, makes everything better, especially Burgers! Now the fun part of this making the menu for the event is that one year ago, almost to the date, my wife and I got to enjoy this Burger at Rub, just like we did today, to celebrate her birthday. I’m willing to guess that other than staff, Cara and I might be the ONLY people to have eaten one of these burgers at Rub before. 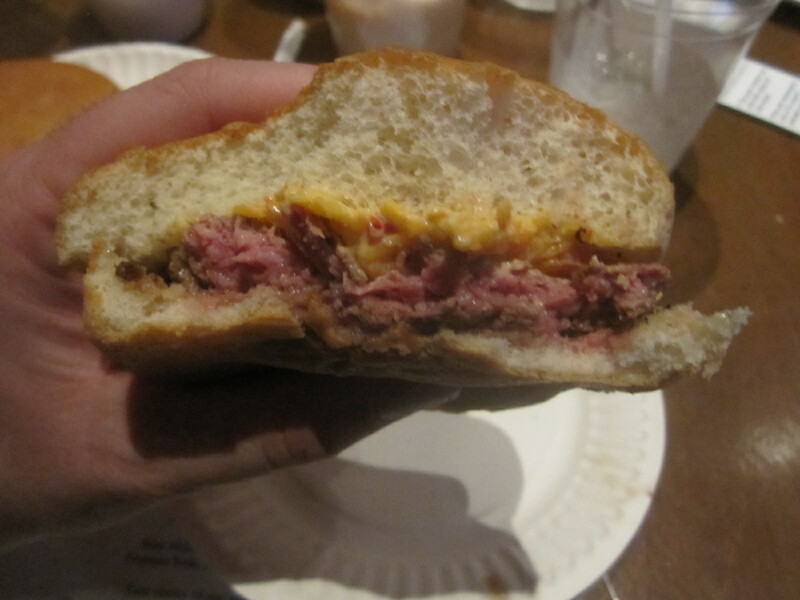 If you think PB on a Burg sound wrong, it’s because you haven’t had Rub BBQ’s version of the burger made famous by the Wheel Inn in Sedalia, MO. 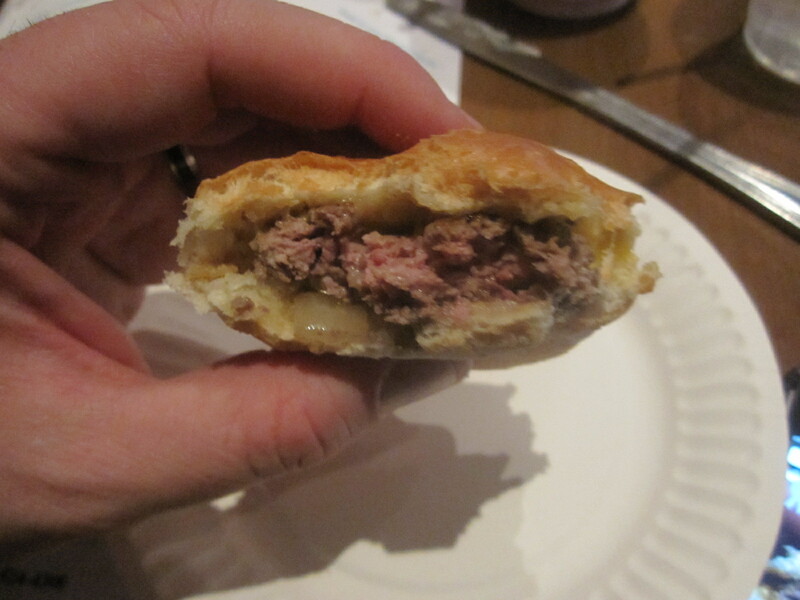 The creamy and salty battle of tastes comes across, at least at this event, almost like a Burger Dessert! With more than a pound of ground beef, accompanied by an array of other ingredients, in my belly, I was feeling more than full and not from just any old food. 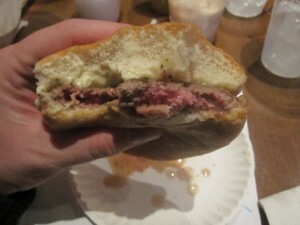 No, these were some of the best burgers ever and the only way to get them was through Thrillist Rewards. 2 sets of 50 people who are already in the know will certainly back me up. Bummed you missed out? Well don’t be no fool and sign yourself up immediately and get discounted access to some of the coolest stuff in NYC and soon to be the world! This entry was posted in Bar, Beer, Best Burger in New York, Burgers, Event, Gourmet Burgers, Sliders, Uncategorized and tagged barbeque, best of, burger, burger bash, butter, cheese, ciancio, conquest, deep fried bacon, french, fries, goober, great, hamburger, jersey, mac-n-cheese, macaroni and cheese, new york, ny, nyc, onions, pimento, rev, review, rub, rub bbq, slider, steamed, the, thrillist, thrillist rewards. Bookmark the permalink.